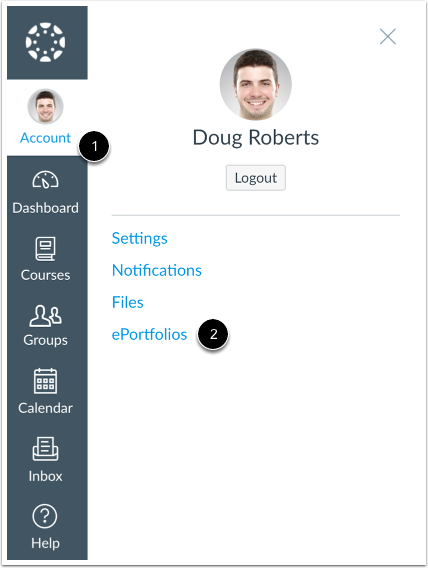 How do I use the ePortfolio Getting Started Wizard as an instructor? The ePortfolio Getting Started Wizard will guide you during the process of creating your ePortfolio. In Global Navigation, click the Account link , then click the ePortfolios link . Click the name of an ePortfolio. Click the Getting Started Wizard link. The Getting Started Wizard will pop up to show you the basics of your ePortfolio. You can read about the Introduction, Portfolio Sections, Section Pages, Adding Submissions, ePortfolio Settings, and Let's Do It. To close the Getting Started Wizard, click the close icon. Your ePortfolio is a way to show off your work to your peers, students, and employers. They are made of sections and pages that are customizable and you are able to add and remove different types of information. The portfolio sections are your navigation links for your portfolio. Each section can have multiple pages inside of it. You can organize the sections by clicking the Organize Sections link. You can also rename a section by clicking the pencil icon, rearrange sections by clicking and dragging, or delete sections by clicking the x icon. The section pages are part of the section links. To organize or add pages, click on the Organize/Manage Pages link. You can also rename a page by clicking the pencil icon, rearrange sections by clicking and dragging, or delete sections by clicking the x icon. You can add assignments to your portfolio from classes you are taking and classes you have taken. You may have noticed at the bottom of this page is a list of recent submissions from your classes. You can quickly add submissions to new pages in your portfolio from this page. Just click the submission you want to add and a simple dialog will pop up. 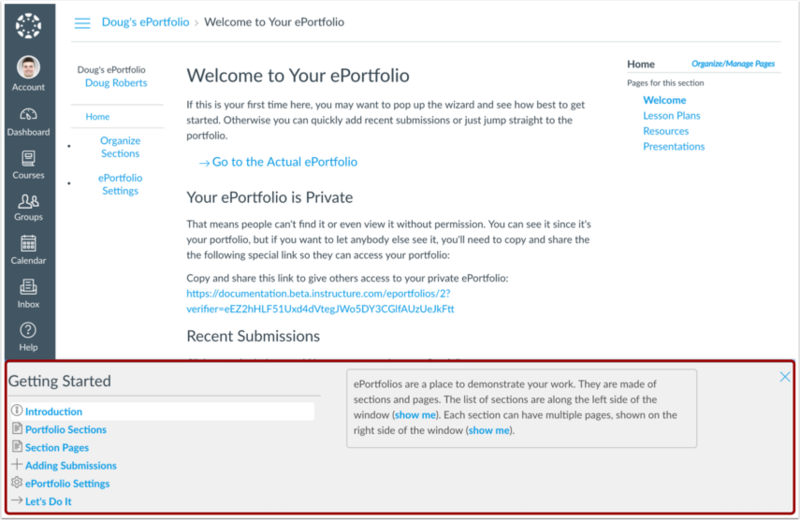 To change the settings for your ePortfolio, click the ePortfolio Settings link. You can rename the portfolio and also change whether it is public or private. Private portfolios are only visible to those to whom you grant access. Ready to get started? You can always get back to this wizard from any page by clicking the "Help How Do I...?" link. Previous Topic:How do I set up a graded discussion to be sent to my institution's student information system (SIS)? Next Topic:How do I create a new ePortfolio as an instructor? Table of Contents > ePortfolios > How do I use the ePortfolio Getting Started Wizard as an instructor?